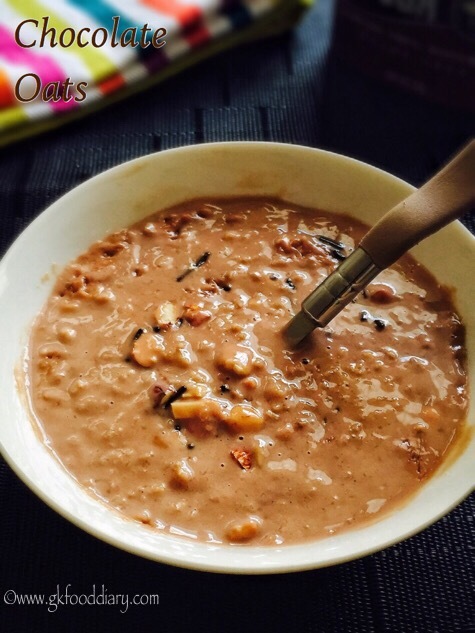 Chocolate Oatmeal/Chocolate Oats – delicious oatmeal recipe made with oats, milk, nuts and and cocoa powder. 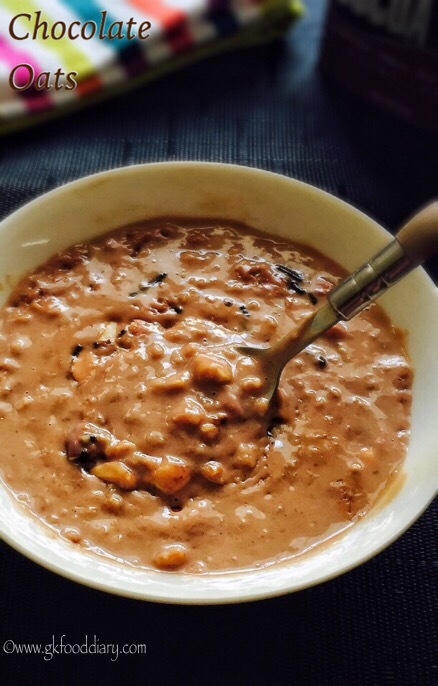 This chocolate oatmeal is perfect for breakfast and it tastes so different from the usual oats porridge. It was a huge hit with my little daughter and am sure most of the kids will love this! 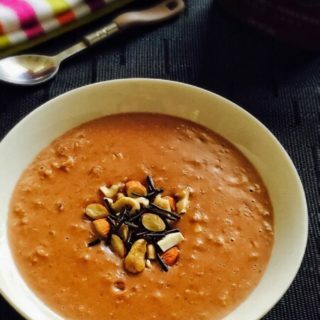 It tastes so good with the addition of cocoa powder and makes you forget its a porridge! This chocolate oatmeal can be given to babies from one year. Check here on introducing and selecting oats for babies. 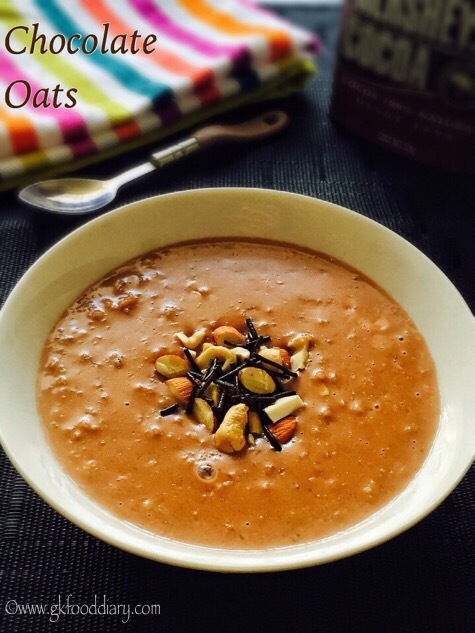 Here is how to make delicious chocolate oatmeal recipe for toddlers and kids. 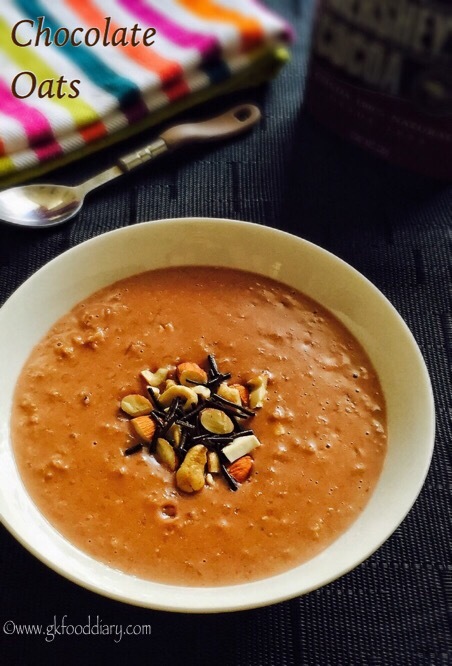 Chocolate Oatmeal- Tasty oatmeal recipe with oats and cocoa powder. Take ½ cup of milk in a saucepan and boil until rolling boil. Simmer the flame to low. 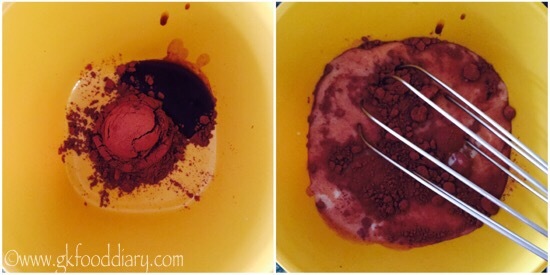 In the meantime, Take cocoa powder and vanilla essence in a mixing bowl. Add in 2 tbsp of milk. Mix it well without any lumps. 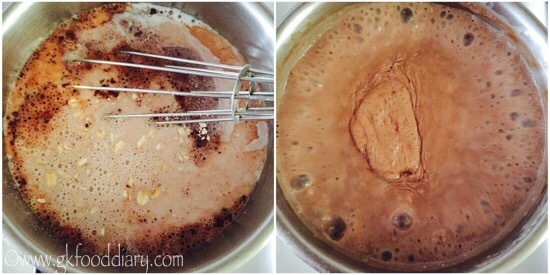 Now add ¼ cup of oats along with cocoa powder mix to the simmered milk. Mix well with a whisk. Make sure there are no lumps remained. Add sweetener at this stage. Give a quick stir. Cook the porridge for 5 minutes until it becomes slightly thick.Once the oats is cooked well, add chopped nuts and chocolate savings. Mix well and switch off the flame. Cool it down and serve warm! 1. 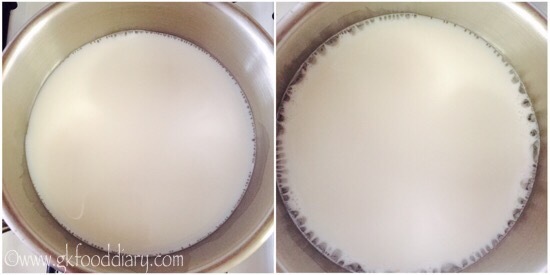 Take 1/2 cup of milk in a saucepan and boil until rolling boil. Simmer the flame to low. 2. In the meantime, Take cocoa powder and vanilla essence in a mixing bowl. Add in 2 tbsp of milk. Mix it well without any lumps. 3. Now add 1/4 cup of oats along with cocoa powder mix to the simmerd milk. Mix well with a whisk. Make sure there are no lumps remained. Add sweetener at this stage. Give a quick stir. Cook the porridge for 5 minutes until it becomes slightly thick.Once the porridge is cooked well, add chopped nuts and chocolate savings. Mix well and switch off the flame. Cool it down and serve warm! The delicious chocolate oatmeal is ready! If the oatmeal becomes too thick, add milk to adjust the consistency while serving. For small babies, you can use nuts powder instead of whole nuts. You could also use jaggery syrup, dates syrup, mashed banana or any fruits as a sweetener. Always check with your doctor before giving any new food to your baby.